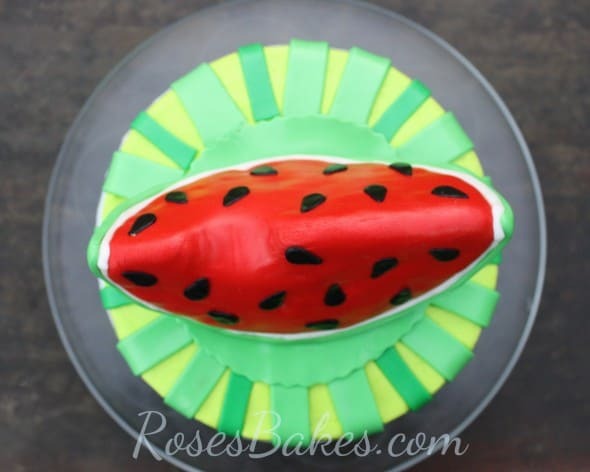 Yesterday I shared with you that I had posted a tutorial on how to make a slice of watermelon cake topper. 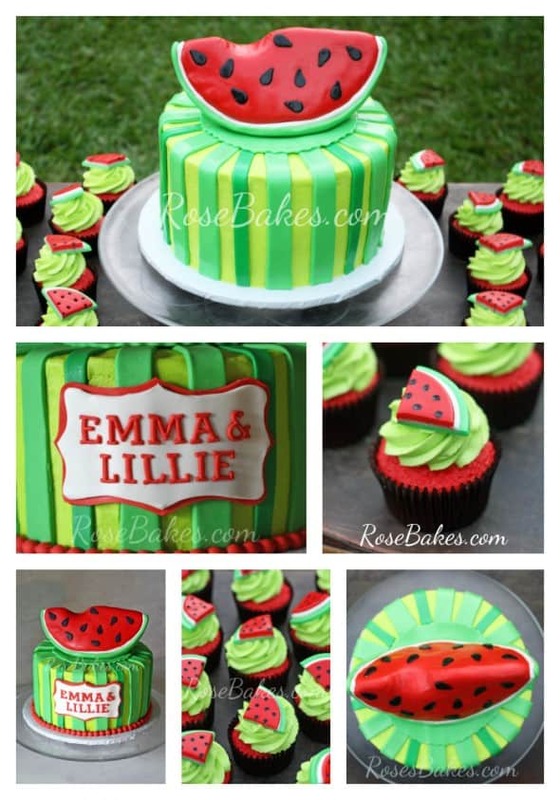 Well today I want to share lots more pics of the Watermelon Cake and Watermelon Cupcakes that went along with it for sweet twin girls, Lillie & Emma’s birthday! 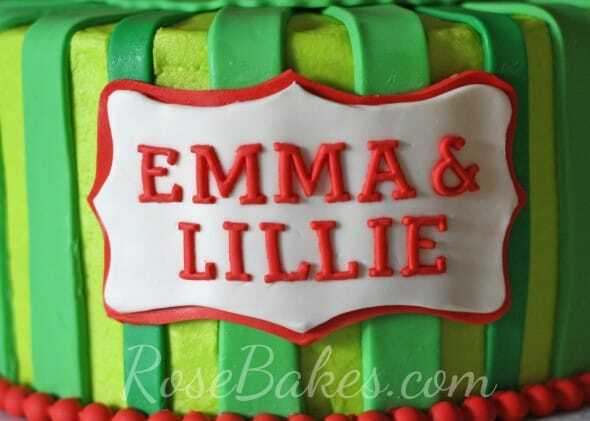 Emma & Lillie are the twin daughters of one of my dearest college friends and I was so excited about her theme! Down here in the south, nothing scream summer more than a big ole slice of watermelon – so it was perfect for a summer birthday bash! So here they are. First I need to explain something. Lots of these outside pictures were taken late in the evening when I thought I was finished with the cake. I wanted my pics to be a little different than usual so I tried something new. But then, later that night when I was looking at the cake – it just seemed incomplete. I messaged my friend Ginnie to ask if she wanted the girls’ names on the cakes and she said yes, so I went to work to try and give the cake a more finished look… I just wish I had thought to photograph the finished cake with the cupcakes. Oh well. What do you think? I used my pearl molds to do the red pearl border and then I used a plaque cutter from CheapCookieCutters.com to add the plaque with the girl’s names. The cake was vanilla cake covered in lime green (or electric green) vanilla buttercream with homemade marshmallow fondant green stripes. I cut the stripes with one of my most favorite tools… the FMM Multi Ribbon Cutter. For the names, I used the Tappit Block Cutters. I wish I had some tiny letters that were more girly but I didn’t and my handwriting is awful when it comes to writing on cakes (in any form!). The slice of watermelon was made from rice cereal treats and again… you can find the link for my tutorial on how to make it here. I used Satin Ice Red and Satin Ice Black vanilla fondant to do it! And now… the cupcakes!! How cute are these? They were inspired by some Watermelon cupcakes I found over on CakeCentral.com. I baked vanilla cake and colored it red with Americolor Tulip Red gel coloring. Then I topped the cake and cupcakes with electric green buttercream. For the watermelon cupcake toppers, I cut out green circles from green homemade marshmallow fondant, then cut out a white circle one size smaller… then a red one even smaller. I dotted them with a black food marker and then cut them into fourths. 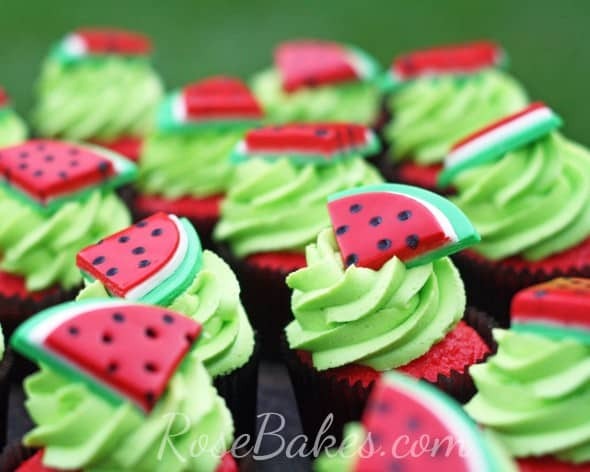 I have a full tutorial for making the watermelon cupcake toppers here. They’re so easy and super cute! And that’s it! Do you have any questions about this cake or cupcakes? Please leave me a comment and I’ll do my best to answer and help out! Love everything! 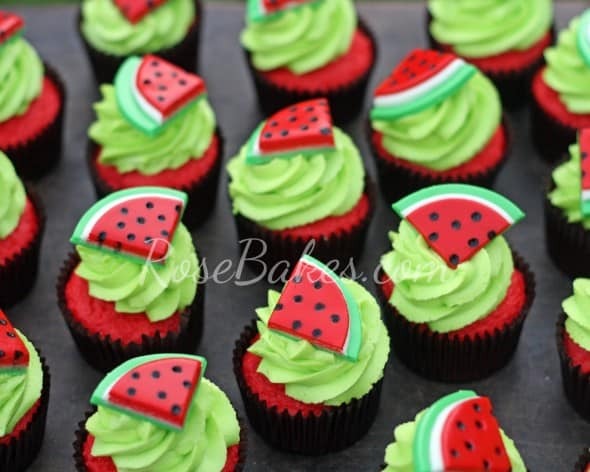 The watermelon toppers are so adorable! How wonderful!!! It would be awesome to see more pictures of how you assembled everything! Okay Brooke! 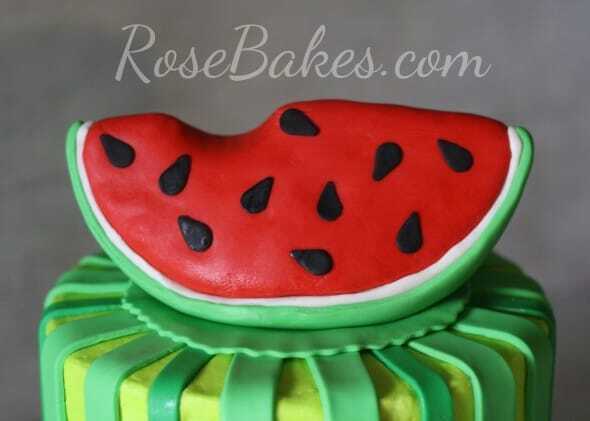 The link to making the watermelon cake topper is up there and I’ll add the cupcake toppers tutorial soon! Hi Rose! 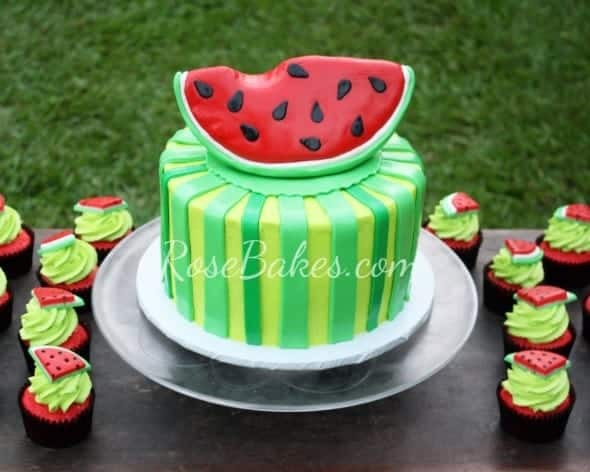 Your watermelon cake and cupcakes are awesome! I love them!! What a cute summer theme! Brilliant! Those cupcake toppers are the cutest things and so cleverly made! Did you have to make separate.batches of the three different shades of green fondant? Or did you make one big batch and just tint pieces of it the shade that you needed as you went along? I made one big batch of green, then divided it in half and added some more green to get one darker shade. I *think* I only used the two shades, plus white. I really don’t remember, but the cupcake toppers were really easy to put together! I am just practicing but how do you get the cake batter so dark?? can you email me the recipe please & steps? 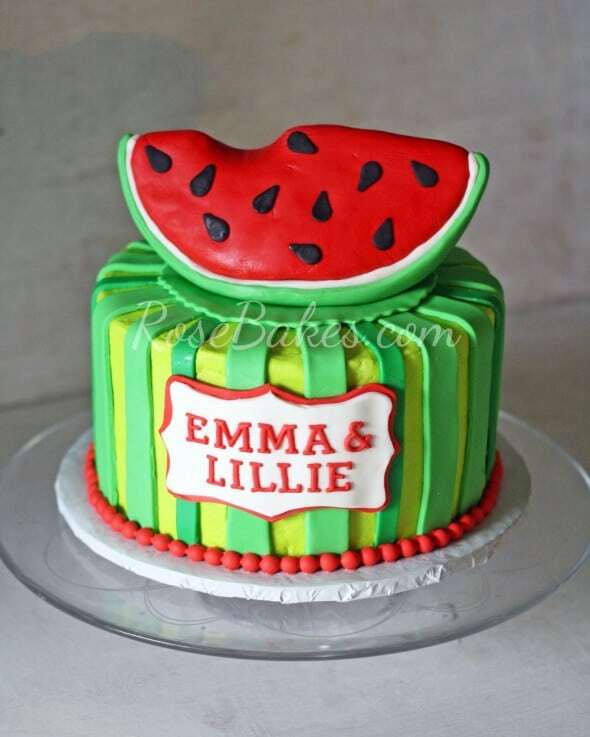 my daughter has been dying for a watermelon birthday cake! Hi Emma. 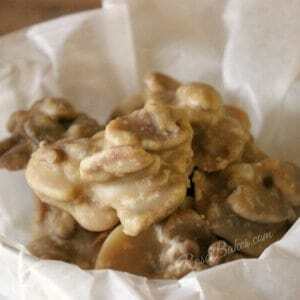 My recipes are linked in the post and I’m sorry, but I don’t have time to write out a step-by-step tutorial right now. 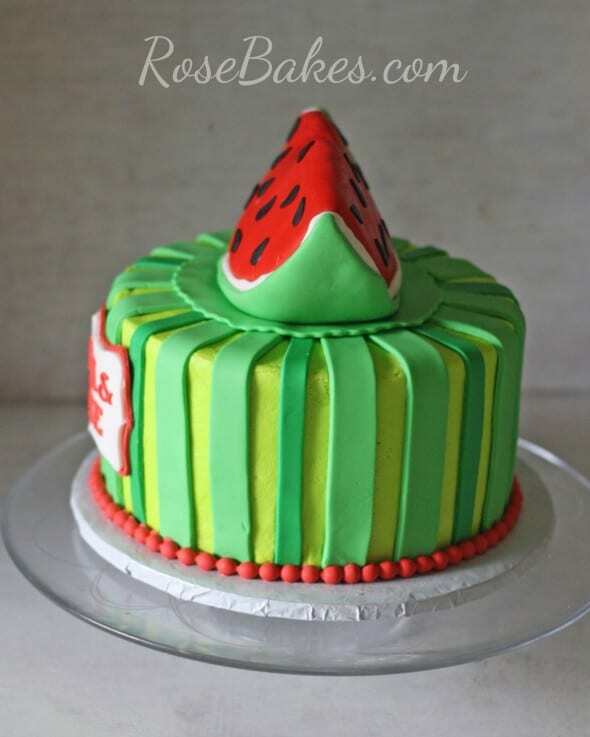 There’s a link in the post for the watermelon cake topper and the cake beneath it is just covered in green buttercream with stripes added. I do hope that helps! 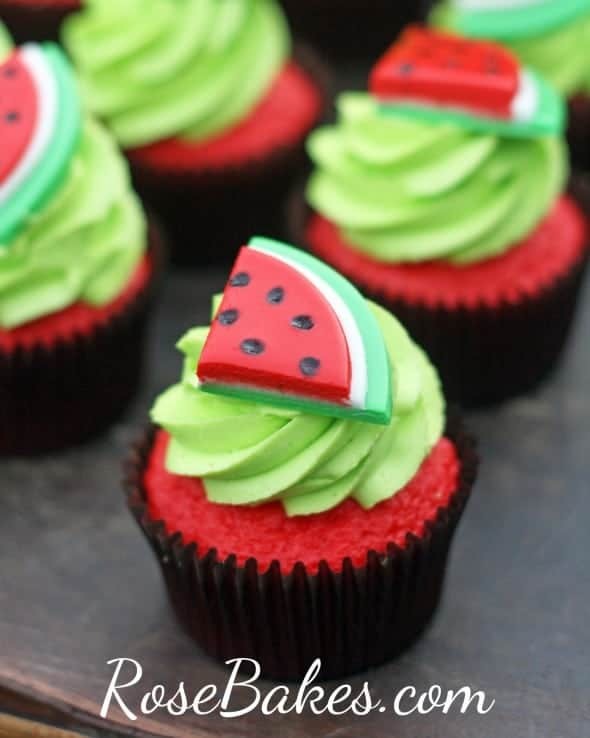 May I see your directions or pics of how you did the watermelon slices on the cupcakes? How did you get the cake so RED?